While Reuters just reported that “China not rattled by age questions,” here is an archived online news report mentioning the age of He Kexin (何可欣), one of China’s famous six. The news was posted on November 3, 2007, written by Xinhua News Agency. Translated caption: The thirteen-year-old He Kexin, from Wuhan, met opponent Yang Yilin, who is on the National Team. Amid cheers from her hometown audience, the young girl excellently executed the full set of moves in the finals, and just beat out Yang Yilin, who already had high scores. Lu Shanzhen, the General Coach of the National Gymastic team, also applauded her performance. 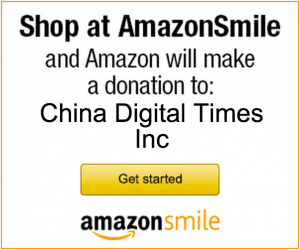 He, Jiang and Yang’s eligibility for the Games had been called into question by American media. Online records seemed to suggest the trio may have broken International Gymnastics Federation (FIG) rules that state athletes must turn 16 by the end of an Olympic year. So the news conference went on and not once did the so-called underaged gymnasts trip up. Life Daily, November 5, 2007: 13 year-old uneven bars athlete He Kexin spectacularly completed the entire “Li Ya Flying Flip” routine, defeating national champion Yang Yilin who herself had just taken bronze at the World Cottbus Cup. Beijing Evening Post, December 12, 2007: The “secret weapon” mentioned by Zhang Peiwen is none other than the recently-appeared new star He Kexin. At just 13, this newcomer has not only completed the “Li Ya Flying Flip” with ease, but performs in competitions with unusual stability for someone her age. People’s Daily, Nov. 3, 2007: Thirteen year-old He Kexin spectacularly completed the “Li Ya Flying Flip” on the girls’ uneven bars gymnastics competition. 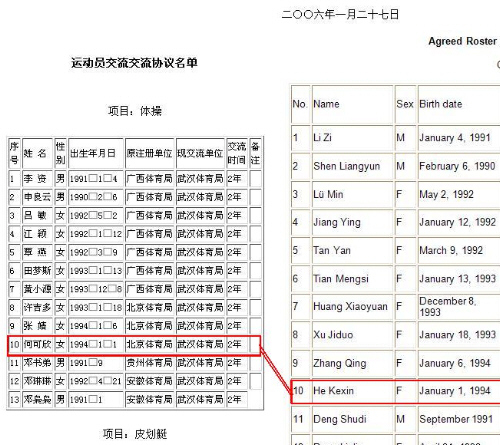 translation: List of Athletes… He Kexin, Birth date: Jan. 1, 1994. In the speech given by Liu Peng (刘鹏), Director of China’s National Sports Administration on November 13, 2007, Liu also mentioned He Kexin’s age: 13. 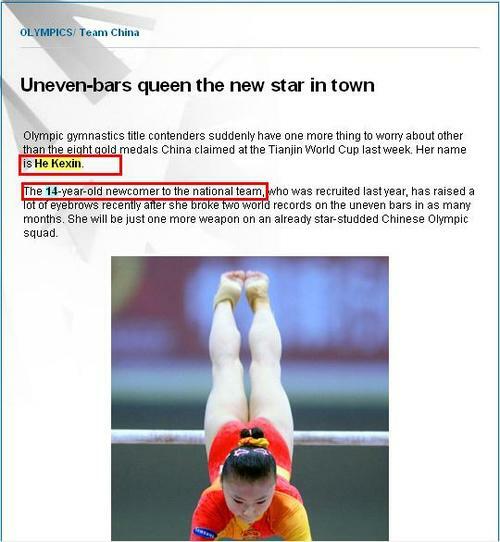 EXHIBIT A: A China Daily article dated May 23, 2008 titled “Uneven-bars queen the new star in town” about He Kexin. This is the cached version (thanks Google) of the article as seen on August 4, 2008. 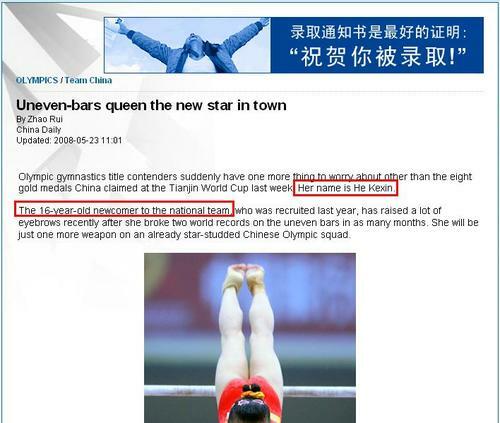 EXHIBIT B: The same China Daily article dated May 23, 2008 titled “Uneven-bars queen the new star in town” about He Kexin. 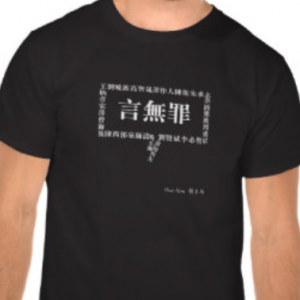 This is the version currently available online. As you can see, when compared to EXHIBIT A, everything is identical. Except for one little thing. The state-run newspaper has changed He’s age. * China’s early press coverage of “secret weapon” He Kexin from China Media Project. * Hack the Olympics by blogger Stryde.